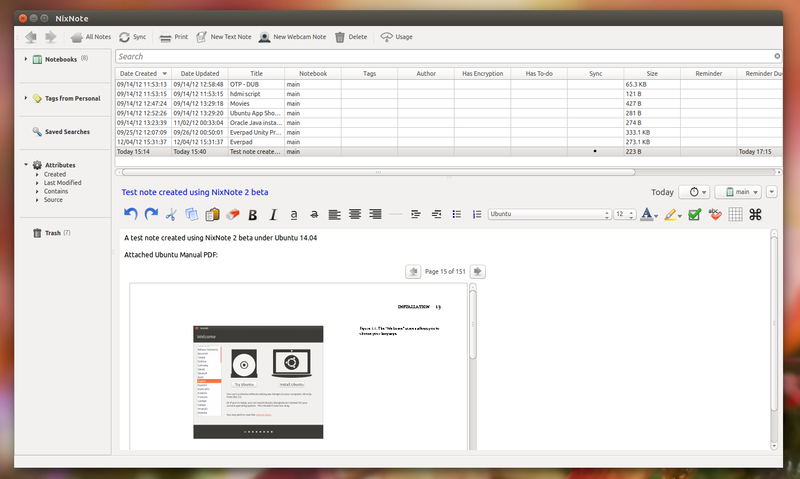 NixNote 2 Beta, EverNote Clients for Linux is now available for download on sourceforge. NixNote is previously known as Nevernote. It is an unofficial client for Linux. Nixnote 1 is written Java. But Nixnote 2 is a complete rewrite of Nixnote 1 in C++ using Qt library. It improves speed and reduce memmory footprint. Java is used for encrypting / decrypting text in NixNote 2. Ubuntu users: The deb files work in Ubuntu 13.10 and 14.04 only (it won’t work in Ubuntu 12.04 or 12.10 due to the required dependencies which aren’t available in older Ubuntu versions)! It’s also worth mentioning that syncing with Evernote is disabled by default. To enable it, from the NixNote 2 menu select Edit > Preferences and enable syncing on the Sync tab. Then select Tools > Synchronize to start synchronizing NixNote 2 with Evernote.